Bridge Education Group will host a series of Higher Education Roadshows in late 2017 and early 2018 that offer U.S. universities unique opportunities for student recruitment and business development across Latin America. 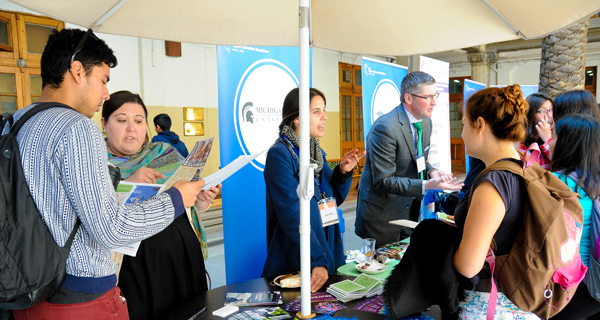 Our first annual Roadshow in Chile was a well-received weekend of networking events that took place in Santiago and Valparaiso in 2015 and brought together American and Chilean universities, Chilean students, and representatives from Chilean government and multinational corporations. Due to its success, the event was hosted in Chile again in 2016. Our upcoming Higher Education Roadshows will expand on the success of the Roadshows in Chile by bringing the program to four major Latin American cities in 2017 and 2018. These intimate events will harness increasing enthusiasm for global student mobility due to expanding economies in the region and recent changes in local policy that put control of international funding at the institutional level. Each Roadshow, open to only 12 institutions, includes events that are carefully chosen to maximize your access to local decision makers and funders of internationalization. Participants will meet with local universities, Ministries of Education, education agencies, multinational corporations, American Chambers of Commerce (representatives from each local office), and the local U.S. Commercial Service / International Trade Commission. Browse detailed itineraries here. - Network with local Ministries of Education to gain insight into how to leverage government-sponsored scholarship programs. - Promote your university to local business sector representatives in a personal, small group setting; present executive education opportunities to HR personnel; and meet multinational companies interested in hosting American interns. - Discover what academic programs are in demand in the local market by meeting with trusted education agents. Receive updates and special pricing offers HERE. Institutions interested in participating in upcoming Roadshows should email Lisa Rooney, Vice President of Institutional Relations at Bridge, at lrooney@bridge.edu.